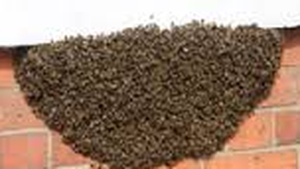 Tameside bees in Ashton-under-Lyne, Audenshaw, Denton, Droylsden, Dukinfield, Hyde, Longdendale, Mossley, Mottram and Stalybridge are already causing problems to householders and businesses at this time of the year. As with wasps, bees will aggressively defend their nest. The wasp, unlike bees which die after stinging, can sting multiple times. A Tameside bees nest can therefore be a danger to anyone who ventures near. The wasp is more likely to sting than a bee but even so you should always call out the professionals for a Tameside bees problem. I have the right protective equipment and tools to do the job properly and more important safely. Inexperienced householders trying to eradicate a wasps or bees nest has resulted in many domestic fatalities from anaphylaxis. Some of the most common types of bees in the UK are the Bumble Bee and the Honey Bee. Bumble Bees are rounder, larger and furrier and come with a variety of coloured stripes across the end of their tails. Nesting sites are normally found underground in abandoned burrows, under the decking, or in compost bins. Honey Bees are providers of honey and are viewed with affection in the UK. They rarely present problems as pests, however, feral swarms can set up home in undesirable places such as chimneys and wall cavities. Honey Bees are small and vary in colour from golden brown to almost black. All the different types of bees in the UK require different methods of treatment. I can solve your Tameside bees problem for a set fee, see price list. I offer a speedy service, usually within the hour. Give me a call on 07940 062670 my services are all fully guaranteed. As well as Tameside bees control, I also provide other pest control services in the Ashton-under-Lyne, Audenshaw, Denton, Droylsden, Dukinfield, Hyde, Longdendale, Mossley, Mottram and Stalybridge areas of Tameside as well as Glossop and Saddleworth. Abate Pest Control Contracts Tameside are available in the boroughs of Ashton-under-Lyne, Audenshaw, Broadbottom, Denton, Droylsden, Dukinfield, Hollingworth, Hyde, Longdendale, Mossley, Mottram and Stalybridge. Pest control contracts are also available in the Delph, Denshaw, Diggle, Dobcross, Grasscroft, Greenfield, Lydgate, Springhead and Uppermill areas of Saddleworth. Additionally pest control contracts in the Chadderton, High Crompton, Lees, Moorside, Royton and Shaw areas of Oldham as well as Glossop, Stockport and Manchester are also covered by Abate Pest Control Services. Abate Pest Control Services have many well known local companies in the Tameside area who employ our services for their pest control and infestation problems. As well as one off visits we offer commercial contracts at very affordable and competitive prices. See our Commercial Treatments price list. We have a great rapport with our commercial and industrial customers who use us time and time again for their Pest Control Contracts Tameside – see the Commercial Testimonials page. Most of these commercial customers have been using our services for many years and the professionalism, effectiveness and satisfaction we give is testimonial to that. Abate Pest Control Services are approved by the Trading Standards Organisation. 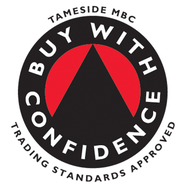 The Trading Standards ‘Buy With Confidence’ scheme was designed to route out rogue traders in the UK. It means all registered members and companies have to undergo rigorous checks to meet the necessary high standards and importantly maintain those standards. Businesses undergo continuous monitoring by Trading Standards officers. If you are looking for a company to service your Pest Control Contracts Tameside then Abate Pest Control Services are the most trusted company in the Tameside, Glossop, Oldham, Saddleworth and Manchester areas.